Skype this week launched the GroupMe app for Windows Phone, following its August acquisition of the tool that enables free, real-time group texting. GroupMe lets you communicate instantly with up to 25 colleagues using chat, photos, and location sharing. Emails get lost and voice mails can take forever for someone to reply to. But with GroupMe, you can send a mobile message to an entire project team or department. It can help you keep your email inboxes clear if you just need to fire off a short message, like a meeting reminder. And the Questions feature lets you send a question to all members of your group simultaneously. GroupMe is unique as one of its main rivals, Beluga, shut down last December. Google+ Hangouts allow you to video chat with up to nine contacts at once, but you have to actively be online to catch them. GroupMe, on the other hand, lets you send messages that group members can pick up whenever they log on. GroupMe is also great for organizing your personal life. Groups are capped at 25 members to limit the annoyance factor of receiving everyone's replies. There is currently no option to leave a specific conversation within a group, and if you leave the group, you cannot be added back to it again. GroupMe is now available for Windows Phone, Android, BlackBerry, and iPhone. SMS mode is handy if you've got a bad data connection. 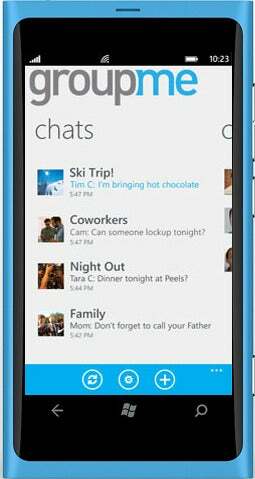 Windows Phone users can pin their GroupMe groups of contacts to their smartphone's home screen. It's too bad that you can't start a group voice call; you'll need to hop over to Skype for that. GroupMe used to enable this feature, now accessible by request only; to ask, email GroupMe at conference@groupme.com. However, I'd like to be able to call up GroupMe groups instantly on Skype and start a conference call with all members. Seamless operation between the two apps, with a message to a Skype group automatically being pushed to GroupMe groups, would be welcome too. However you use it, this is an app with some possibilities, especially if Skype amps up the integration.